In describing various economic train wrecks these last few weeks, I may have given the wrong impression about trains. I love riding the train on the East Coast or in Europe. They’re usually a safe and efficient way to travel. And I can sit and read and work, plus not deal with airport security. But in this series, I’m concerned about economic train wrecks, of which I foresee many coming before The Big One which I call The Great Reset, where all the debt, all over the world, will have to be “rationalized.” That probably won’t happen until the middle or end of the next decade. We have some time to plan, which is good because it’s all but inevitable now, without massive political will. And I don’t see that anywhere. Unlike actual trains, we as individuals don’t have the option of choosing a different economy. We’re stuck with the one we have, and it’s barreling forward in a decidedly unsafe manner, on tracks designed and built a century ago. Today, we’ll review yet another way this train will probably veer off the tracks as we discuss the numerous public pension defaults I think are coming. Last week, I described the massive global debt problem. As you read on, remember promises are a kind of debt, too. Public worker pension plans are massive promises. They don’t always show up on the state and local balance sheets correctly (or directly! ), but they have a similar effect. Governments worldwide promised to pay certain workers certain benefits at certain times. That is debt, for all practical purposes. If it’s debt, who are the lenders? The workers. They extended “credit” with their labor. The agreed-upon pension benefits are the interest they rightly expect to receive for lending years of their lives. Some were perhaps unwise loans (particularly from the taxpayers’ perspective), but they’re not illegitimate. As with any other debt, the borrower is obligated to pay. What if the borrower simply can’t repay? Then the choices narrow to default and bankruptcy. Today’s letter is chapter 6 in my Train Wreck series. If you’re just joining us, here are links to help you catch up. An interesting aspect of this is that many younger teachers, who are a long way from retirement age, are very engaged in preserving their long-term futures. This disproves the belief that Millennial-generation Americans think only of the present. From one perspective, it’s nice to see, but they are unfortunately right to worry. Demographic and economic reality says they won’t get anything like the benefits they see current retirees receiving. And it’s not just teachers. The same is true for police, firefighters, and all other public-sector workers. Thinking through this challenge, I’m struck by how many of our economic problems result from the steady aging of the world’s population. We are right now living through a combination unprecedented in human history. Neither of these happened naturally. The first followed improvements in artificial birth control, and the second came from better nutrition and health care. Each is beneficial in its own way, but together they have serious consequences. This happened quickly, as historic changes go. Here is the US fertility rate going back to 1960. As you can see, in just 16 years (1960–1976), fertility in the US dropped from 3.65 births per woman to only 1.76. It’s gone sideways since then. This appears to be a permanent change. It’s even more pronounced in some other countries, but no one has figured out a way to reverse it. Again, I’m not saying this is bad. I’m happy young women were freed to have careers if they wished. I’m also aware (though I disagree) that some think the planet has too many people anyway. If that’s your worry, then congratulations, because new-human production is set to fall pretty much everywhere, although at varying rates. 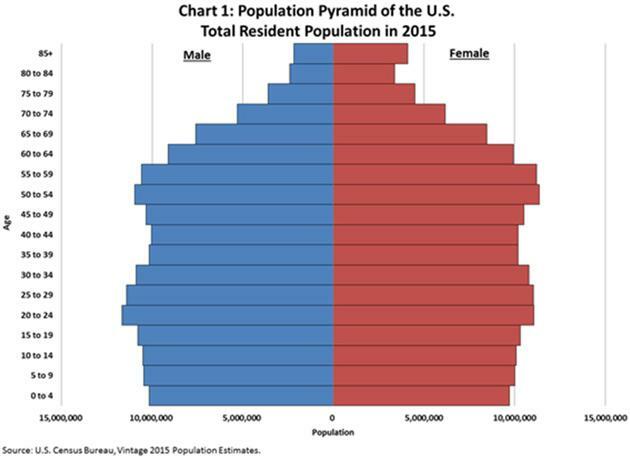 Breaking down the US population by age, here’s how it looked in 2015. 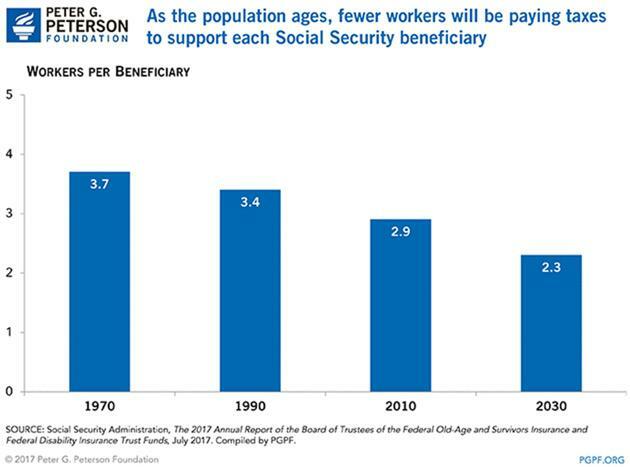 This is the base challenge: How can a shrinking group of working-age people support a growing number of retirement-age people? The easy and quick illustration to this question is to talk about the number of workers supporting each Social Security recipient. In 1940, it was 160. By 1950 it was 16.5. By 1960 it was 5.1. I think you can see a trend here. As the chartbelow shows, it will be 2.3 by 2030. Similarly, states and local governments are asking current young workers to support those already in the pension system. The math is the same, though numbers vary from area to area. How can one worker support two or three retirees while still working and trying to raise a family with mortgage payments, food, healthcare, etc.? Obviously, they can’t, at least not forever. But no one wants to admit that, so we just ignore reality. We keep thinking that at some point in the future, taxpayers will pick up the difference. And nowhere is it more evident than in public pensions. But wait, those who get longer lifespans will still get Social Security and pensions. That data isn’t in the unfunded projections we will discuss in a moment. So, whatever I say here will be significantly worse in five years. Let me tell you, that’s a high order problem. Do you think I want to volunteer to die so that Social Security can be properly funded? Are we in a Soylent Green world? This will be a very serious question by the middle of the next decade. We have discussed the pension problem before in this letter—at least a half-dozen times. 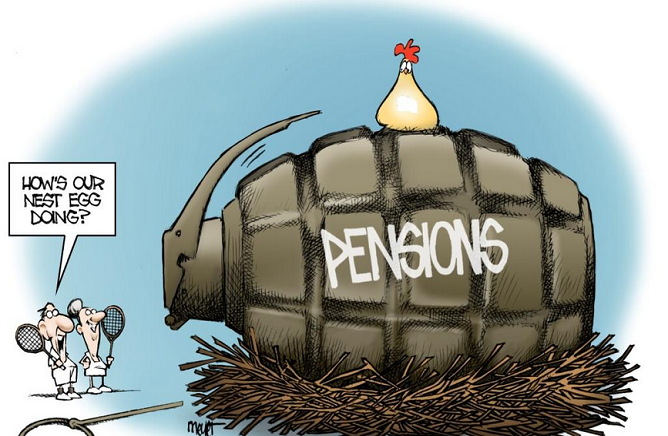 Most recently, I issued a rather dire Pension Storm Warninglast September. I said in that letter that I expect more cities to go bankrupt, as Detroit did, not because they want to, but because they have no choice. You can’t get blood from a rock, which is what will be left after the top taxpayers move away and those who stay vote to not raise taxes. This means city and school district retirees will take major haircuts on expected pension benefits. The citizens that vote not to pay the committed debt will be fed up with paying more taxes because they will be at the end of their tax rope. I am not arguing that is fair, but it is already happening and will happen more. States are a larger and different problem because, under our federal system, they can’t go bankrupt. Lenders perversely see this as positive because it removes one potential default avenue. They forget that a state’s credit is only as good as its tax base, and the tax base is mobile. Let me say this again because it’s critical. The federal government can (but shouldn’t) run perpetual deficits because it controls the currency. It also has a mostly captive tax base. People can migrate within the US, but escaping the IRS completely is a lot harder (another letter for another day). States don’t have those two advantages. They have tighter credit limits and their taxpayers can freely move to other states. In theory, state pensions are stand-alone entities that collect contributions, invest them for growth, and then disburse benefits. Very simple. But in many places, all three of those components aren’t working. Employers (governments) and/or workers haven’t contributed enough. Investment returns have badly lagged the assumed levels. Expenses are more than expected because they were often set too high in the first place, and workers lived longer. Any real solution will have to solve all three challenges—difficult even if the political will exists. A few states are making tough choices, but most are not. This is not going to end well for taxpayers or retirees in those places. Worse, it isn’t just a long-term problem. Some public pension systems will be in deep trouble when the next recession hits, which I think will happen in the next two years at most. Almost everyone involved is in deep denial about this. They think a miracle will save them, apparently. I don’t rule out anything, but I think bankruptcy and/or default is the more likely outcome in many cases. The good news is we’re starting to get data that might shake people out of their denial. A new Harvard study funded by Pew Charitable Trusts uses “stress test” analysis, similar to what the Federal Reserve does for large banks, to see how plans in ten selected states would behave in adverse conditions (hat tip to Eugene Berman of Cox Partners for showing me this study). Their models also include two plan funding assumptions. In the first, they assume states will offset market losses with higher funding. (Fat chance of that in most places. Seriously, where are Illinois, Kentucky, or others going to get the money?). The second assumes legislatures will limit contribution increases so they don’t have to cut other spending. Admittedly, these models are just that—models. Like central banks models, they don’t capture every possible factor and can be completely wrong. They are somewhat useful because they at least show policymakers something besides fairytales and unicorns. Whether they really help or not remains to be seen. 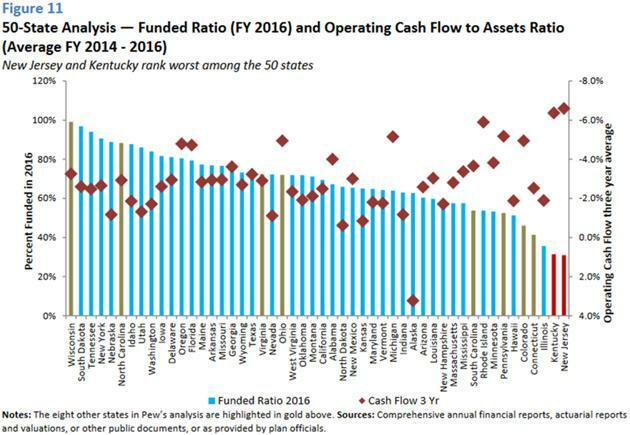 Crunching the numbers, the Pew study found the New Jersey and Kentucky state pension systems have the highest insolvency risk. Both were fully-funded as recently as the year 2000 but are now at only 31% of where they should be. Other states in shaky conditions include Illinois, Connecticut, Colorado, Hawaii, Pennsylvania, Minnesota, Rhode Island, and South Carolina. If you are a current or retired employee of one of those states, I highly suggest you have a backup retirement plan. If you aren’t a state worker but simply live in one of those states, plan on higher taxes in the next decade. 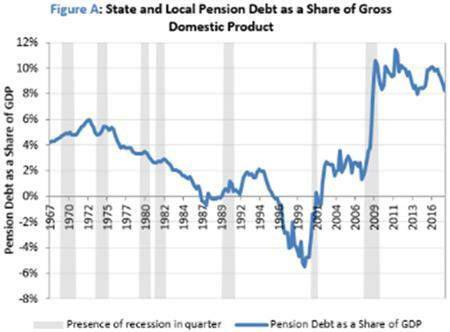 For a few halcyon years in the late 1990s, pension debt was negative, with many plans overfunded. The early-2000s recession killed that happy situation. Then the Great Recession nailed the coffin shut. Now it is above 8% of GDP and has barely started to recover from the big 2008 jump. Again, this is only state and local worker pensions. It doesn’t include federal or military retirees, or Social Security, or private sector pensions and 401Ks, and certainly not the millions of Americans with no retirement savings at all. All these people think someone owes them something. In many cases, they’re right. But what happens when the assets aren’t there? The stock market boom helped everyone, right? Nope. States' pension funds have nearly $4 trillion of stock investments, but somehow haven't benefited from soaring stock prices. A new report by the American Legislative Exchange Council (ALEC) shows why this is true. It notes that the unfunded liabilities of state and local pension plans jumped $433 billion in the last year to more than $6 trillion. That is nearly $50,000 for every household in America. The ALEC report is far more alarming than the report from Harvard. They believe that the underfunding is more than 67%. There are several problems with this. First, there simply isn’t $6 trillion in any budget to properly fund state and local government pensions. Maybe a few can do it, but certainly not in the aggregate. Second, we all know about the miracle of compound interest. But in this case, that miracle is a curse. When you compute unfunded liabilities, you assume a rate of return on the current assets, then come back to a net present value, so to speak, of how much it takes to properly fund the pension. This means in six years, without the $6 trillion being somehow restored (magic beans? ), pension underfunding will be at $8.4 trillion or thereabouts, even if nothing else goes wrong. That gap can narrow if states and local governments (plus workers) begin contributing more, but it stretches credulity to say it can get fixed without some pain, either for beneficiaries or taxpayers or both. I noted last week in Debt Clock Ticking that the total US debt-to-GDP ratio is now well over 300%. That’s government, corporate, financial, and household debt combined. What’s another 8% or 10%? In one sense, not much, but it aggravates the problem. Connecticut, the state with the highest per-capita wealth, is only 51.9% funded according to the Wall Street Journal. The ALEC study mentioned above would rate it much worse. Your level of underfunding all depends on what you think your future returns will be, and almost none of the projections assume recessions. The level of underfunding will rise dramatically during the next recession. Total US government debt from top to bottom will be more than $40 trillion only a few years after the start of the next recession. Again, not including unfunded liabilities. We’ll stop there for now. Let me end by noting this is not simply a US problem. Most developed countries have their own pension crises, particularly the southern Eurozone tier like Italy and Greece. We’ll look deeper at those next week. The Harvard Kennedy School 50-State Stress-Test analysis on Assessing the Risk of Fiscal Distress for Public Pensions is an excellent 72-page report that is well worth a closer look.